YouTube rolled out a really fascinating feature in its mobile apps. The feature enables the YouTube users to share videos and chat with their friends through a tab within YouTube’s mobile app. The newly released feature turned the app into sort of mobile messenger. Google is testing the feature since last one year. Prior to this feature, YouTube users had to close the app to send message to their peers for telling about the new song just released or something you liked. But with the release of YouTube Messenger, now users don’t have to close their app instead they can send message to their friends while staying within the app. The feature is available for both android and iOS users but can’t be reached from desktop site. 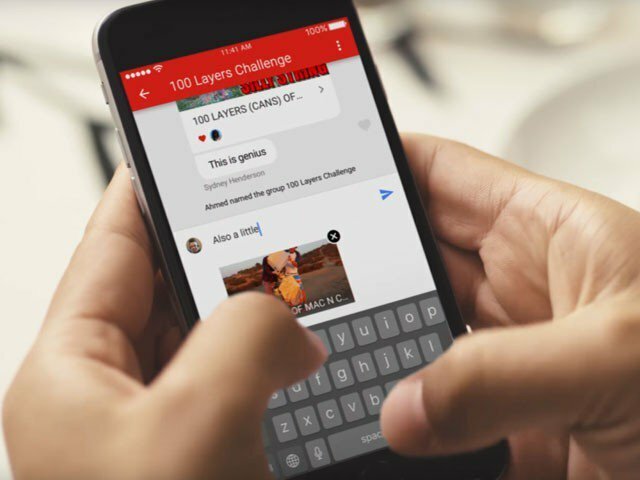 YouTube’s Messenger feature lets users to send a clip to friends. Messages and emojis can also be shared. With the feature, users can share YouTube videos with people either from their contact list or can send an invite link. YouTube users can share message with a single person or group of peoples. Users can also share another video during conversation. Additionally, YouTube’s users can also add reaction to a particular message. Users can also utilize the option of search to add anything during conversation. YouTube users can share video in group to maximum of 30 people. Invitation can also be sent to others to join the conversation. The most prominent characteristic of newly released feature is that it allows users to send private messages to their loved ones. Either they are food recipes or makeup tutorials, favorite movie or most trending song, comedy shows or political news, each and every kind of video can be shared with peers, spouse or loved ones without exiting the app. Hence YouTube’s will act like a destination to its users where they can spend time in. App also suggests the people with whom user may have interacted with on YouTube. Suggested friend list may also contain those with whom user have interacted through other Google services like hangouts or have sent mail via Gmail. When it comes to technology, there are always some downsides. The newly rolled out feature of YouTube app is also having some downsides. YouTube app hasn’t turned out block option for its messaging feature. Unfortunately, phone book doesn’t display that which of their friends are using YouTube’s and which are not. It would be more convenient if app could identify. There is no option to deny the requests from those who are unknown to users. However YouTube’s is viewing these problems and hope so in near future will overcome all of these drawbacks. YouTube’s became more convenient, reliable and comforting for its users. YouTube’s rolled out the feature because as with the feature users can share videos more conveniently, hence more videos will be shared and more revenue will be generated. Hence engaging more people is the main purpose. Stay connected with androidpowerhub.com for more eye captivating apps.